Over the past few weeks I have been providing numerous new winter works including those that practice reading, writing, listening, comparing, beginning letter sounds, counting, recognizing differences, etc. One of these works that has been great practice for the Pre- K students has been this counting snowflake math work. This activity practices a number of skills such as one-to-one correspondence, counting in sequence, fine motor skills, and number recognition. 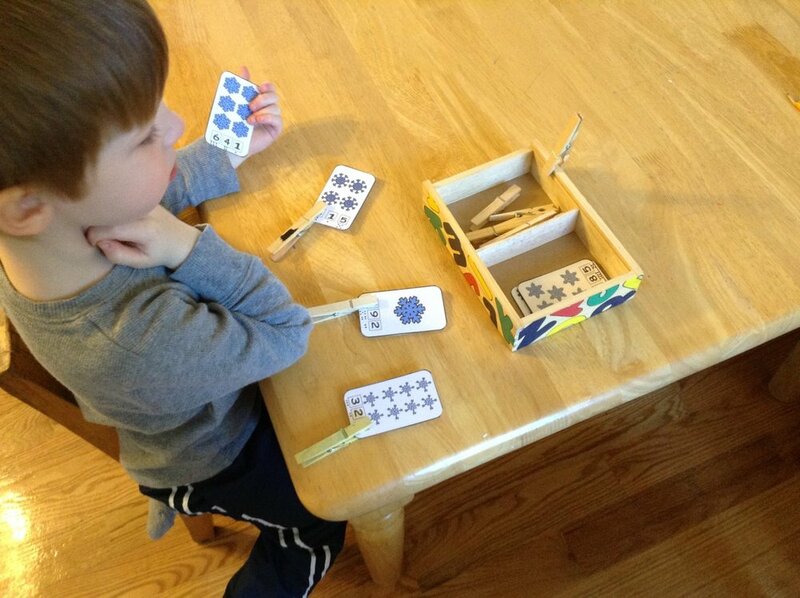 The child takes the snowflake cards out and is requested to count the snowflakes using their one-to-one correspondence skills. This skill is one that we have been practicing since the beginning of the year and will continue to practice until the end. I have noticed that the students have greatly improved on being able to count while pointing to each item without going too fast. Now we need to practice where to start counting and how to go through all the items so that no snowflakes are missed or accidentally added. Once the child has figured out how many snowflakes are pictured on the card, they use their number recognition skills to find which listed number is the correct one that corresponds with the snowflakes pictured. I did add dots underneath each number so that if a child did not know what the number was, they could count the dots to figure it out. However, all the students I've observed using this work haven't needed to count the dots which is fantastic! Once the child has figured out the number they need, they use their fine motor skills to squeeze a clothespin, maneuver the card in their other hand, and put the clothespin over the correct box. I've been really proud of all the Pre- Kindergarten kids and all the hard work they have been doing each day! The cold weather hasn't frozen our learning and progress at school!